A couple years back, I was starting to feel like I wasn't getting enough exercise. I had gone through many phases where I would go to the gym for a few months, then fall out of it for a few months. That mostly stemmed from the fact that I really didn't enjoy myself when I was there. But how could I keep myself in shape as I started to get older without wanting to tear my hair out? I started to think about the outdoor activities I really enjoyed, and realized that one of my favorite things to do was go to the beach. That seemed like a good place to start. My first thoughts were to learn how to surf. Those were dashed when I realized that my local beaches didn't have waves big enough to truly support that hobby. I continued to ask around, and one of my friends suggested that I try stand-up paddle boarding. Within a few days, I searched out a place where I could rent a standard stand-up paddle board, and took a quick lesson. It was difficult at first, but I really enjoyed the challenge. I got much better by the end of the day, and the way my body felt when I woke up let me know that it was truly a great workout for my core and arms. Add that to the serious cardio benefits, and I knew I’d found the perfect exercise for me. For the first few months, I continued to experiment with renting different boards. Then, one of the places I rented from suggested that I try an inflatable SUP. Until that point, I didn’t even know inflatable paddle boards even existed. I took one out for the day, and fell in love. The lighter weight of this inflatable paddle board made it so easy to transport and ride, though it still had basically the same health benefits as a standard board. It was so much easier to control, which made the ride even more fun. Plus, the softer material the board was made out of made me much less wary of getting hurt if I wiped out. Once I found out about the existence of inflatable paddle boards, I knew it was time to make my new hobby a permanent one by finally making a purchase. I got home from that day’s excursion, eager to jump on my computer to search for my very first board. The guy who rented me the board suggested I check out BoatsToGo.com, and that’s where I started my search. Though I checked out a bunch of other places, I eventually realized that the guy knew what he was talking about, and ended up back at BoatsToGo. That’s where I bought my first Saturn Inflatable SUP, the 11’ SUP330. In fact, that’s where I bought the only inflatable paddle board I have ever owned. 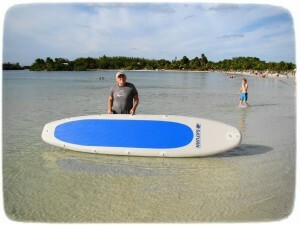 My Saturn inflatable SUP was not only extremely affordable, but incredibly durable too. The heavy-duty PVC fabric it’s made up of has never shown any rips, punctures, or abrasions since I purchased my board. It’s is so easy to inflate and deflate that I can do it each time I ride, allowing me to store my board in a normal closet when I’m not using it. And as a bonus, my Saturn inflatable SUP also doubles as a kayak on days when I want to switch up my watersports activity. Good thing that guy told me to check out BoatsToGo!